PowerPoint 2013 is Microsoft’s new version of their presentation program. With PowerPoint 2013 you can create stylish and captivating presentations quickly and easily. Let’s get started with PowerPoint 2013. 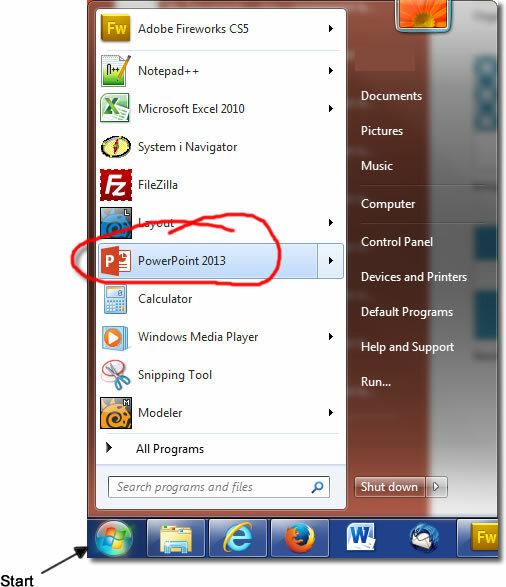 Click the Start button and then select PowerPoint 2013. If you can’t see it in the list, start typing “PowerPoint 2013” in the search box at the bottom until it does appear in the list. When PowerPoint opens you will se a list of your recently opened presentations on the left, and a selection of templates that you can use to create a new presentation. If you want to open a presentation you worked on recently, click on it in the Recent list. If you can’t see it in the list, click on Open Other Presentation and navigate to where it is: select it and click Open. If you want to create a new presentation, you can select Blank Presentation in the templates area, or select one of the readymade templates. If you choose Blank Presentation, you can create your own look and feel from scratch, whereas if you choose a ready made template, all the styling is already done for you. There is a wide range of templates available so you should find something you like. You can always modify an existing template yourself to get the look just right. When editing a presentation, whether it is a new one or an existing one, by default you will see a list of slides that exist in the presentation over on the left. In the centre of your workspace is the currently selected slide and running across the top of the workspace is the ribbon. The ribbon contains a number of tabs that contain commands you can use to add or amend content on your slides. This is only a brief getting started guide, so we’ll only cover the more commonly performed tasks here. Use the links on the side to learn about particular topics in more depth. The very first slide you see in a new blank presentation is a title slide. A title slide has a text box at the top for the title of the presentation, and a text box below for the subtitle. Just click in either of those boxes and start typing. On the home tab in the ribbon, you will see a New Slide command (in the Slides group on the left). Click the top half of that button to add a new title and Content slide (the most widely used layout) or click the bottom half of the button to select a different layout for your slide. To add you own content, just click in the top text box and then bottom box and start typing. The top box is for the title of the slide and the bottom box is for the content. Adding images to your presentation is a great way to illustrate your point. To add an image, you first need to be on the Insert tab. In the Images group you will see Pictures on the left. Click on that button and then navigate to where your picture is on your hard drive. Click on it and then click Insert. screenshots – PowerPoint has its own screenshot tool you can use to take a screenshot of any other application you are working in. There will be tutorials teaching you how to add all of the above elements. One of the most important tasks you will perform, and one that you should perform as soon as possible – save your presentation. The quickest way is probably to press ctrl + s on your keyboard, but you can also click the File tab > Save. If you are working on a new presentation, you will be prompted to provide a name for it and decide where on your computer to store it; if it’s an existing presentation the save will simply update the presentation with your recent changes. When your presentation is ready to run, or if you just want to demo it to see what it looks like, you can either press F5 on your keyboard, or click Slide Show > From Beginning to run the presentation from the first slide. Stay tuned for more in depth tutorials on… everything!